Drew James Rucinski (pronounced roo-chin-ski)... 2007 graduate of Tulsa Union High School in Tulsa, Oklahoma, where he won state championships during sophomore and junior years...attended Ohio State University from 2008-11; went 5-3, 2.95 ERA (82.1/27) as a senior in 2011...was college teammates with fellow 2018 Marlins' non-roster invitees RHP Alex Wimmers (2008-10) and OF J.B. Shuck (2008). Spent most of year with Triple-A Rochester in Twins' system, earning International League Midseason All-Star honors...Made 32 appearances (two starts) for Red Wings...Posted 2-2 record and one save with 1.54 ERA (35.0 ip/6 er) in first half; was 0-4 with 3.86 ERA (28.0/12) in second half...Did not allow a run in 12 straight appearances (21.1 innings) from May 27-July 15...After allowing a run in six of seven appearances, posting four losses and 8.74 ERA (11.1/11), from July 29-August 17, rebounded with four scoreless outings (8.1 ip) to end season...Had brief stint with Twins from May 5-10, making two relief appearances...Tied career MLB high with five strikeouts on May 6 vs. Boston. Made 2015 Opening Day roster for Angels and appeared in four games, making first career start on April 14 at Texas (2.2 ip, 6 h, 4 r, 4 er, 4 bb)...Had five stints with Los Angeles: Opening Day-April 15; June 7-13; July 31-August 3; August 25-27; and September 1-5. Pitched majority of season with Double-A Arkansas...Went 10-6 with a 3.15 ERA (148.2 IP - 52 ER) across 26 starts while recording 140 strikeouts and just 41 walks...Ranked second in Texas League with 140 strikeouts, sixth with 148.2 innings pitched and tied for eighth with 10 victories...Led Travelers in strikeouts, starts and innings pitched...Named Texas League Player of the Week for June 2-9 after tossing complete game shutout vs. Northwest Arkansas allowing just five hits with no walks and six strikeouts...Named to Texas League Mid-Season All-Star team...In 10 starts from June 7 - Aug. 1, went 7-0 with a 2.35 ERA (65 IP - 17 ER)...Recorded 54 strikeouts and 12 walks in that span...Had contract selected by Angels July 10 and made Major League debut that night at Globe Life Park in Arlington...Allowed two earned runs on four hits in one inning pitched vs. Rangers during ninth inning of Angels 15-6 victory...Optioned back to Arkansas July 12...Made one postseason start for Arkansas and earned the win after tossing seven shutout innings at Tulsa in Game 1 of the Texas League North Division playoffs Sept. 3rd...Recalled by Angels Sept. 19 for second big league stint...Pitched four innings in relief that night vs. Texas and allowed two runs on three hits across four innings pitched (allowed no runs on one hit with four strikeouts through first three innings of that appearance)...Tossed 2.1 shutout innings in relief during final outing of the year Sept. 22 at Oakland. October 26, 2018 RHP Drew Rucinski elected free agency. October 26, 2018 Miami Marlins sent RHP Drew Rucinski outright to New Orleans Baby Cakes. August 10, 2018 Miami Marlins activated RHP Drew Rucinski from the 10-day disabled list. August 9, 2018 Miami Marlins sent RHP Drew Rucinski on a rehab assignment to New Orleans Baby Cakes. August 4, 2018 Miami Marlins sent RHP Drew Rucinski on a rehab assignment to Jupiter Hammerheads. 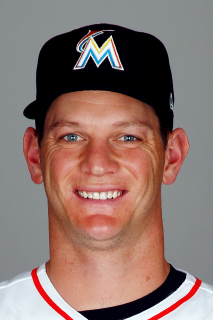 July 9, 2018 Miami Marlins placed RHP Drew Rucinski on the 10-day disabled list. Right groin strain. June 3, 2018 Miami Marlins selected the contract of RHP Drew Rucinski from New Orleans Baby Cakes. February 8, 2018 RHP Drew Rucinski assigned to New Orleans Baby Cakes. November 27, 2017 Miami Marlins signed free agent RHP Drew Rucinski to a minor league contract and invited him to spring training. September 6, 2017 Rochester Red Wings released RHP Drew Rucinski. June 14, 2017 Minnesota Twins signed free agent RHP Drew Rucinski to a minor league contract. June 14, 2017 RHP Drew Rucinski assigned to Rochester Red Wings. June 13, 2017 RHP Drew Rucinski elected free agency. June 13, 2017 Minnesota Twins sent RHP Drew Rucinski outright to Rochester Red Wings. June 11, 2017 Minnesota Twins designated Drew Rucinski for assignment. May 30, 2017 Minnesota Twins optioned RHP Drew Rucinski to Rochester Red Wings. May 29, 2017 Minnesota Twins recalled Drew Rucinski from Rochester Red Wings. May 19, 2017 Minnesota Twins optioned RHP Drew Rucinski to Rochester Red Wings. May 18, 2017 Minnesota Twins recalled Drew Rucinski from Rochester Red Wings. May 10, 2017 Minnesota Twins optioned RHP Drew Rucinski to Rochester Red Wings. May 5, 2017 Minnesota Twins selected the contract of Drew Rucinski from Rochester Red Wings. December 15, 2016 Minnesota Twins signed free agent RHP Drew Rucinski to a minor league contract and invited him to spring training. December 15, 2016 RHP Drew Rucinski assigned to Rochester Red Wings. November 7, 2016 RHP Drew Rucinski elected free agency. September 15, 2016 Iowa Cubs activated RHP Drew Rucinski from the 7-day disabled list. September 5, 2016 Iowa Cubs placed RHP Drew Rucinski on the 7-day disabled list. November 28, 2015 RHP Drew Rucinski assigned to Iowa Cubs. November 16, 2015 Chicago Cubs signed free agent RHP Drew Rucinski to a minor league contract and invited him to spring training. November 6, 2015 RHP Drew Rucinski elected free agency. September 4, 2015 Los Angeles Angels sent Drew Rucinski outright to Salt Lake Bees. September 1, 2015 Los Angeles Angels designated RHP Drew Rucinski for assignment. August 27, 2015 Los Angeles Angels optioned RHP Drew Rucinski to Salt Lake Bees. August 25, 2015 Los Angeles Angels recalled Drew Rucinski from Salt Lake Bees. August 3, 2015 Los Angeles Angels optioned RHP Drew Rucinski to Salt Lake Bees. July 31, 2015 Los Angeles Angels recalled Drew Rucinski from Salt Lake Bees. June 13, 2015 Los Angeles Angels optioned RHP Drew Rucinski to Salt Lake Bees. June 7, 2015 Los Angeles Angels recalled Drew Rucinski from Salt Lake Bees. April 15, 2015 Los Angeles Angels optioned RHP Drew Rucinski to Salt Lake Bees. October 13, 2014 Drew Rucinski roster status changed by Los Angeles Angels. October 2, 2014 Los Angeles Angels reassigned RHP Drew Rucinski to the minor leagues. September 19, 2014 Los Angeles Angels recalled RHP Drew Rucinski from Arkansas Travelers. July 12, 2014 Los Angeles Angels optioned RHP Drew Rucinski to Arkansas Travelers. July 10, 2014 Los Angeles Angels selected the contract of Drew Rucinski from Arkansas Travelers. March 27, 2014 RHP Drew Rucinski assigned to Arkansas Travelers from Inland Empire 66ers. March 3, 2014 RHP Drew Rucinski assigned to Los Angeles Angels. August 9, 2013 RHP Drew Rucinski assigned to Inland Empire 66ers. August 6, 2013 Los Angeles Angels signed free agent RHP Drew Rucinski to a minor league contract. March 28, 2012 Lake County Captains released RHP Drew Rucinski. September 1, 2011 RHP Drew Rucinski assigned to Lake County Captains from Mahoning Valley Scrappers. July 21, 2011 Drew Rucinski assigned to Mahoning Valley Scrappers from AZL Indians. June 29, 2011 Drew Rucinski assigned to AZL Indians from Mahoning Valley Scrappers. June 16, 2011 Drew Rucinski assigned to Mahoning Valley Scrappers from Cleveland Indians. June 15, 2011 Cleveland Indians signed free agent RHP Drew Rucinski to a minor league contract.